Our cushions have been made! | Crowlas & Ludgvan W.I. Our cushions have been made! With thanks to Helen for the delicious cakes and cookies to accompany the cups of coffee necessary to keep us all going (after all, making cushions is thirsty work ! 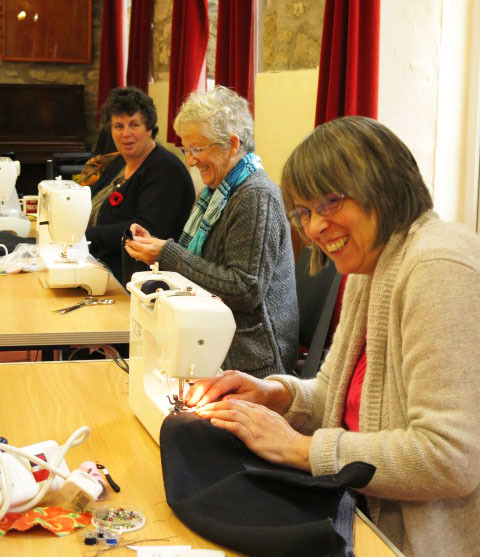 ); and to Lis Davies, Joy George, Pat Gloyn, Sue Knights, Diane Curnow and Mary Venn who all came armed with sewing machines and worked under the guidance of our master seamstress, Val Puddiphatt. Thanks also to Shirley Battle who was armed with a hot iron followed by some preparation pinning for the sewers, and finally to Alison Latham for some template work and for stuffing the foam into the beautifully completed cushion covers for all to see at the next monthly meeting. Make sure you give big thanks to Val and her crew at our next meeting! This entry was posted in Uncategorized and tagged craft, cushions, Murley Hall, workshops. Bookmark the permalink.